PHOENIX (AP) — Rep. Ruben Gallego said Monday he won't run for the U.S. Senate, likely avoiding a contentious fight for the Democratic nomination to finish John McCain's last term. PHOENIX (AP) — Mark Kelly's campaign for Arizona's U.S. Senate seat in 2020 says it has raised more than $1 million in individual contributions since announcing his candidacy Tuesday morning. PHOENIX (AP) — Retired astronaut Mark Kelly entered the race Tuesday to finish John McCain's term in the U.S. Senate, looking to join a small club of space explorers who have served in the U.S. Capitol. 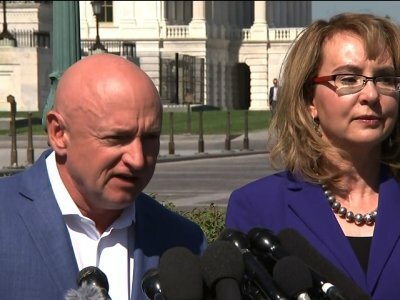 CINCINNATI (AP) — Former U.S. Rep. Gabby Giffords called Wednesday for political action against gun violence, during an Ohio appearance for a Democratic congressional candidate. ROCK HILL, S.C. (AP) — A South Carolina congressman pulled out his own loaded handgun during a meeting with constituents Friday to make a point that guns are dangerous only in the hands of criminals. Republican U.S. Rep. Ralph Norman placed the .38-caliber gun on a table during the "coffee with constituents" meeting at a Rock Hill restaurant, news outlets reported. NEWARK, N.J. (AP) — The New Jersey Hall of Fame is expanding. Gov. Chris Christie announced Tuesday that a $400,000 Department of State grant will fund an exhibition from the hall at Newark Liberty International Airport. It's part of an effort to update the airport terminals. The Republican governor saYS the Port Authority of New York and New Jersey is funding the project. The view from space is incredible, says Mark Kelly, former astronaut and mission commander for the space shuttle Endeavour's last journey in 2011. "You see how incredible our planet is from space, just floating there in all the blackness of space," he said Thursday at a media conference leading up to his appearance as the first lecturer in the 2017-18 Omnibus Lecture Series at IPFW. His lecture, "Endeavour to Succeed," took place in the Auer Performance Hall in the Rhinehart Music Center. TUCSON, Ariz. (AP) — Former Rep. Gabby Giffords on Friday endorsed Ann Kirkpatrick in the Democratic primary for southern Arizona's 2nd Congressional District, a move that gives Kirkpatrick a boost as she faces a crowded primary field. The move by Giffords and her husband, retired astronaut Mark Kelly, comes as Kirkpatrick works to gain traction in the district she adopted in order to run for the seat now held by Republican Martha McSally. PHOENIX (AP) — Former Arizona Congresswoman Gabby Giffords with husband and retired astronaut Capt. Mark Kelly on Thursday announced a new Arizona group focused on passing gun safety legislation. Giffords and Kelly announced the bipartisan group known as Arizona Coalition for Common Sense during a news conference in Phoenix, saying state leaders need to act to keep guns out of the wrong hands. Giffords was nearly killed by an assassin's bullets in 2011. TUCSON, Ariz. (AP) — The radio spot features the father of an aide to former U.S. Rep. Gabby Giffords recalling the moment he realized his son, Gabe Zimmerman, had died following the 2011 mass shooting in Tucson. Then, Mark Kelly, the retired astronaut married to Giffords, briefly talks about a moment after the former congresswoman was released from the hospital. PORTLAND, Maine (AP) — Former U.S. Rep. Gabby Giffords says "stopping gun violence takes courage" as she returned to Maine to urge voters to support expanded background checks for gun purchases. Giffords appeared at Congress Square Park in Portland on Wednesday alongside Portland Police Chief Michael Sauschuck and a citizen co-sponsor of Question 3 on the Nov. 8 ballot in Maine.